Western/Central Bhutan: Paro, Thimpu, Punakha, Trongsa & Bumthang. After lunch, we visit the Trashi Chhoe Dzong, the heart of the Bhutanese government (Sunday only).. Nearby can be seen the King's palace and the assembly building across the river. Afterwards we visit the weekend market and Changangkha Lhakhang, an ancient temple and monastic school high on a ridge above the city. Blessed with a temperate climate and drained by the Phochu and Mochu rivers, is the fertile valley of Punakha. Before Thimphu was made the capital of Bhutan, Punakha held the title as the winter capital because of its more temperate climate. Today it is the winter seat of Je-Khenpo (the Chief Abbot) and the Central Monk Body. Punakha Dzong (1250m), built at the junction of the Phochu and Mochu rivers in 1637 by the first Shabdrung of Bhutan, Ngawang Namgyal, served as both the religious and the administrative center of Bhutan. Visit Wangdue valley, the gateway to Central and Eastern Bhutan. Wangdue is a small town located on a ridge that plunges into the Puna Tsang River flowing below. Sitting atop the ridge with a commanding view of the valleys below is the Wangdue Phodrang Dzong. Continue to Trongsa (2,200m), the ancestral home of the Royal Family of Bhutan. Drive across the Pelela Pass (3,400m) and through the Jigme Singye Wangchuck National Park, which divide western and central Bhutan. Cross the Nikka Chu Bridge to enter the heavily cultivated Trongsa regions in central Bhutan. Beside the stream, is the great white stupa, the Chendebji Chorten built in the 19th century in Nepalese design, stands below the road as testimony to the subjugation of a demon by the Lam Shida. 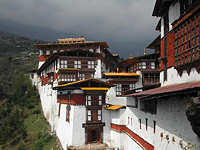 Visit Trongsa Dzong, the most impressive Dzong in Bhutan. Built in 1647 by Shabdrung, this Dzong itself is a labyrinth of temples, corridors and offices holding court over the local community. An architectural masterpiece, it is built on many levels into the sides of the hill, and can be seen from every approach to Trongsa, declaring its strength and majesty. You will also visit the ancient watchtower situated above the town. From Trongsa, you will drive on to Jakar, in the Bumthang valley across the Yotong Laa Pass (3,425m). 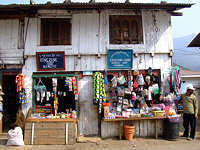 Enroute stop at Zungney (2,750m) to see the traditional weavings of Yathra, the woolen fabric in numerous colors and patterns. Continue overland to Bumthang (2,800m). 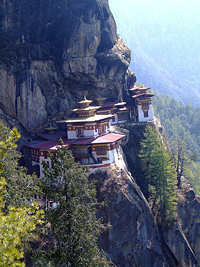 This is one of the most spectacular valleys in Bhutan and also the heartland of Buddhism. Here the great teachers meditated and left in there wake many sacred grounds. The Guru and his lineage of Tertons, the treasure finders, have laid to the sprouting of many temples in the valley. Start your tour of the city with a walk up to Tamshing Monastery, founded by Terton Pema Lingpa, where about 200 monks reside. 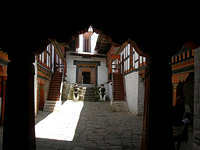 Visit Wangdichholing Palace, Jambay and Kurjey Lhakhangs, the oldest monasteries in the kingdom. 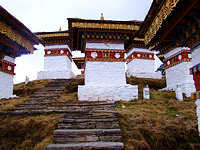 All the Kings of Bhutan are cremated at Kurjey Lhakhang. Visit some of the numerous temples in the city. Drive to the Meebartsho (Burning Lake), where Terton Pema Lingpa was led by mystic forces to discover spiritual treasures at the bottom of the lake. This is one of the many sacred Buddhist pilgrimage sites. Visit a Swiss farm and taste sweet cheese, apple brandy and locally brewed wine and beer. Journey back to Punakha with ssightseeing along the way. Day 8: Punakha - Paro. Visit Chimi Lhakhang, a monastery situated on a hillock with center of valley below Metshina, built by Lama Drukpa Kuenley (also known as the Divine Madman). It’s about 20minutes walk across from the road at Sopsokha to the temple. It is believed that childless women who visit the temple will conceive after receiving "wang"(blessing). 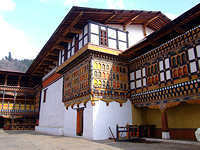 Continue drive to Paro, enroute you will pass by Semtokha Dzong built in 1629 by Shabdrung Ngawang Namgyal. 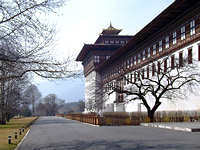 It is the oldest fortress of its kind that guarded the Thimphu valley, Semtokha Dzong is today a theological university. Visit Ta Dzong, the National Museum housed in an ancient watchtower, which has a fine collection of ancient Thangkha paintings, textiles, weapons and other artifacts; visit one of the most celebrated Dzongs in Bhutan, the Rinpung Dzong, or the Fortress of the Heap of Jewels. Day hike to Taktsang Monastery’s viewpoint. Taktsang meaning "Tiger's Nest”, is built around a cave in which Guru Rimpoche (also known as Guru Padmasambhava) meditated. The monastery clings seemingly impossible to a cliff of rock at 914m above the valley floor. For the local people it is a place of pilgrimage, but for a tourist, a hike up to the viewpoint opposite the monastery is exhausting, thrilling and mystical. The legend has it that Guru Rimpoche is said to have flown to the site of the monastery on the back of a tigress from Tibet and meditated in the cave there for three months. Although the main building of the temple was destroyed by fire on April 1998, the hike up to the viewpoint is worthwhile and fulfilling. It was reconstructed in the year 2000 and consecrated in March 25, 2005. Drive to the end of the valley to look at the old ruined fortress of Drugyel Dzong or the Fort of Drukpa Victory (14km from Paro), the historical site from the ramparts of which the Bhutanese repelled Tibetan invaders, time and time again. On a clear day, you will be overawed by the sight of the 7,315m white-domed peak of the sacred Mount Jhomolhari (Mountain of the Goddess JHOMO) that looms overhead. Enroute visit Kyichu Lhakhang (from outside) and Satsam Chorten: Kyichu Lhakhang is said to have been built by King Songtsen Gampo of Tibet in 659.It's believed that it holds down the left foot of an ogress, so large that it covers Bhutan and most of eastern Tibet. An 11 day tour to this remote kingdom.